BB creams have been the rage in Asian and have recently made its way overseas. Since then, I find that the BB creams in America V.S. Asian are a down grade to say the least. I hope this review gives some extra knowledge and saves you come extra cash. & I want to let you know what I am writing about is knowledge I already learned, I am not a doctor of any means, and this is my own thought on these products. I am so not being paid to do this review. 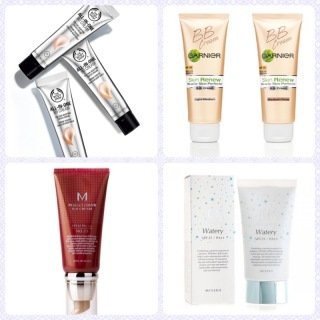 Asia - BB Creams are Beauty Balm with skincare benefits. America - BB Creams are Tinted Moisturizers meant for some coverage and some sun protection. After observing the drugstore and seeing the reaction of the new overseas BB creams, my hopes in wanting to purchase the American version has decrease. Even those who are extreme makeup junkies who like the American version of the BB cream have no knowledge that they could be spending the same amount of money on an Asian brand and get better skin V.S. not getting anything else but poor coverage and oily skin. The American BB that is strikingly similar (not to be confused with the ones in the cosmetic aisle, I'm referring to the ones in the Skin Care aisle) to the Asian one costs more at a local drugstore, which makes since because it's made on our soil, but is it worth it? I don't think so. American BB Creams I've Tested sample sizes of $9-$14 versions from the drugstore & they do no contain anything skin benefits except for sunscreen. Though that is important, I crave for more than just mediocre coverage. Example, the L'oreal BB Cream seeks to just improve the outer appearance of the skin, rather than actually helping to fix it underneath. The Garnier is probably the one that appears to be a legit bb cream, except it does not have again the legit skin care needs such as anti-aging. I would be repeating myself over and over again if I keep comparing, so let's just move on and call it a day. OVERALL, American BB creams are false advertisements, they are not a BB cream, and they are more like a tinted moisturizer. The only good thing...the shades they have produced. I just wish the American version of the cream didn't butcher the name BB cream for a tinted moisturizer. These are products I have tried, tested, and even worn everyday. All opinons are my own. The Body Shop BB Cream was sent as a gift from a friend. Pros: Medium to Full Coverage, SPF 42, and for every skin type. Cons: Strong Scent, Transferable. Pros: Light to Medium Coverage, SPF 27. Cons: Not for oily skin. I hope this review was useful, have a happy 2013!